UK Citizens' Assemblies > Citizens' Assembly on Brexit > Trade: How much does the UK trade? The charts give you some numbers on trade. The first two charts give information on how much trade the UK does with the EU and with countries outside the EU. The chart on the left shows how much the UK exports to other countries in the EU and how much it exports to countries outside the EU. Until about ten years ago, the UK exported more to EU countries than it did to all other countries combined. Since then, the UK has been exporting more to countries outside the EU. But exports to the EU are still a large part of our economy. The chart on the right shows how much the UK imports from other countries in the EU and how much it imports from countries outside the EU. Throughout the period shown, the UK has imported more from EU countries than from countries outside the EU. This chart shows the UK’s balance of trade with countries in the EU and with countries outside the EU. The balance of trade is the difference between the value of exports and the value of imports. If the number is greater than 0, that means that we export more than we import. If the number is less than 0, we import more than we export. For many years, there was not much difference between the balance of trade with EU and non-EU countries. But a gap has opened up in the last few years. The UK is importing more from the EU than it is exporting, and is importing less from countries outside the EU than it is exporting. What does the UK Trade? The next charts look at what the UK trades. They divide our trade between goods and services. Then they subdivide further into different kinds of goods and services. 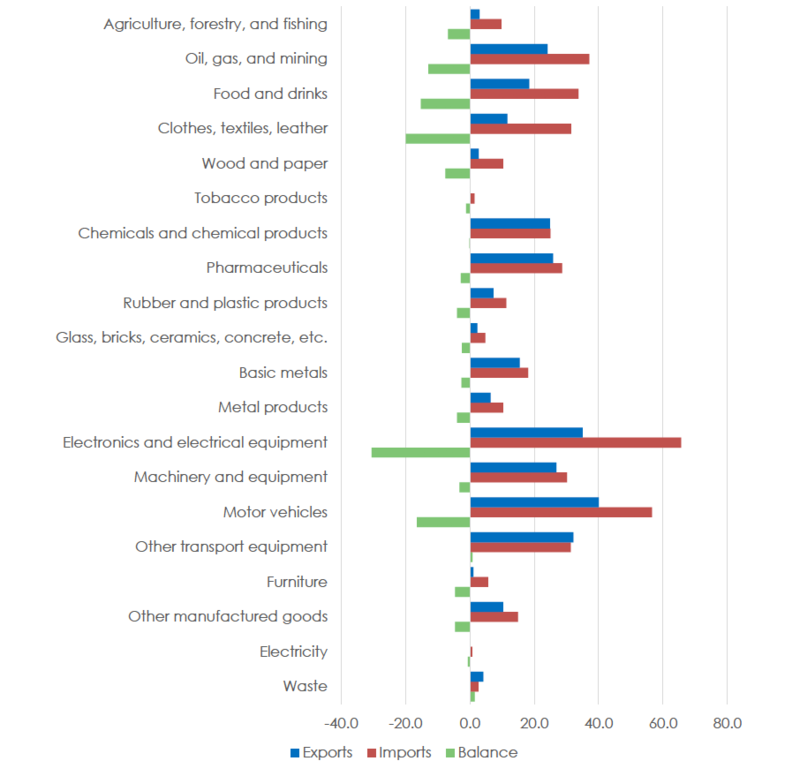 The chart on the left shows how much the UK exports, divided between goods and services. We export more goods than services, but the gap is narrowing. The chart on the right shows how much the UK imports, again divided between goods and services. Here the gap has been widening. Our imports of goods have been rising steeply, while our imports of services have been increasing more slowly. This chart shows the UK’s balance of trade in goods and in services. The balance of trade is the difference between the value of exports and the value of imports. As for chart 2, if the number is greater than 0, that means that we export more than we import. If the number is less than 0, we import more than we export. The chart shows a longer time period than the previous graphs. You can see that the balance of trade in goods and in services has gradually changed over time. We now have a big surplus in services. In other words, we export services much more than we import. But we have a big deficit in goods. We import goods much more than we export. 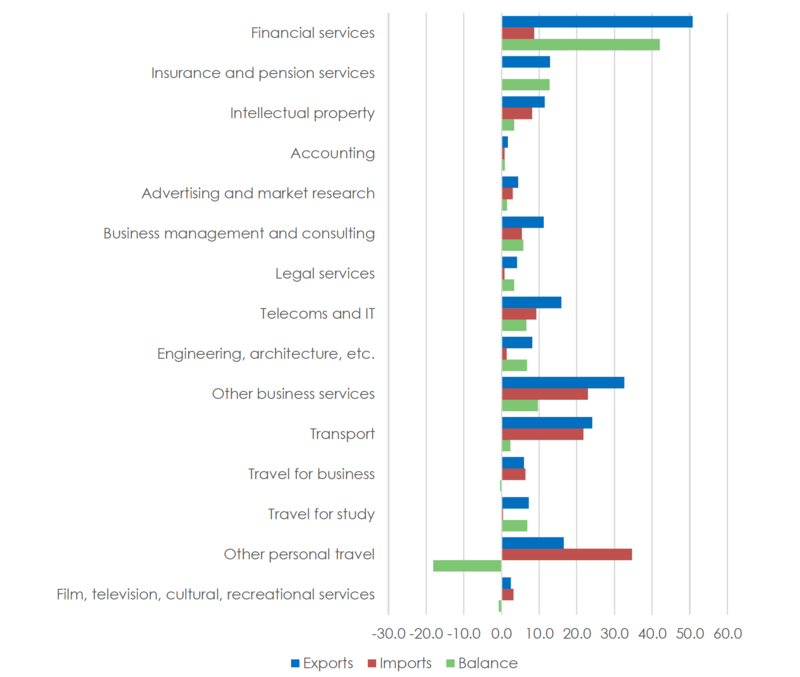 This chart shows UK trade in services in 2015. The blue bars show exports and the red bars show imports. The green bars show the balance between these. Where the balance is more than 0, that means we export more than we import. Where the balance is less than 0, we import more than we export. The UK makes large surpluses in financial services and many other business-related services. We export these services much more than we import them. We also make a big surplus in study. Many people come to the UK to study, while far fewer British people go to other countries to study. The one area where we have a large deficit is in personal travel, which is mostly tourism. The UK earns a lot from tourists who visit from other countries. But we spend more than that on our own foreign holidays. This chart shows UK trade in goods in 2016. The blue bars show exports and the red bars show imports. The green bars show the balance between these. We have a trade deficit in almost every area, meaning that we import more than we export. But we nevertheless have important export industries in things like cars, electronics, oil, and pharmaceuticals.